From the passing of Mother Teresa’s father, Mother Teresa and her family held onto their religious beliefs. When her father had passed away, they were left with financial problems leaving them to strive on their own. By holding onto their religious beliefs, they were able to pull through and Mother Teresa could help others who were in the same or similar situation by believing in God. This had happened when she felt the calling from God to become a nun. When Mother Teresa became a nun she had to take 3 important vows. These vows were poverty, chastity and obedience. The vow of poverty is about imitating Jesus who lived a poor life although he was rich. By doing this, it helps nuns to become poor in spirit and live a life of labor to dedicate them to work. By taking this vow, Mother Teresa gave up materialistic goods and her family to live independently to pursue her calling and free herself to dedicate her life to serving God and others. The second vow Mother Teresa had taken was the vow of chastity. The vow of chastity’s aim is to imitate Jesus who was chaste meaning that he never got married. In essence, it is the vow that doesn't allow Mother Teresa to have a relationship such as getting married or sexual behaviors as they are meant to give all their love to God. By giving their love to God, when they help other people they are helping them with God’s love. Mother Teresa believed that the dignity of every human being should be respected as we are all made in image and likeness of God. She believed that everyone should be treated equally as we are all children of God. There were people who lived on the streets or had been abandoned by loved ones such as the sick with diseases such as leprosy. No-one loved them or offered to look after them so she put her life at risk by cleaning, taking care of them and creating hospices where she would try enlighten and make them happy before dying so they could reach salvation. Mother Teresa believed that wealth should be distributed evenly as everyone needs the essentials to live. As mentioned, there were people living on the streets as well as children who were unable to afford food. Mother Teresa wasn't wealthy put she played her part in helping them out. By doing this she collected left over food from people and distributed it among the homeless and the sick. Last but not least, is an important belief which was considered to be Mother Teresa's fourth vow which was 'wholehearted and free service to the poorest of the poor'. 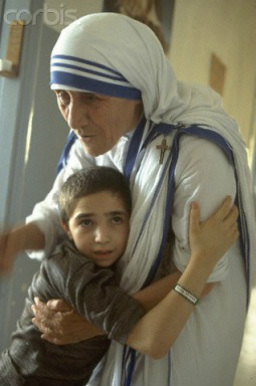 Mother Teresa believed her calling was to help and helping does not come at any price. By helping another person especially the poorest of the poor it gave the person the opportunity to have hope in the future such as a diseased to get better as they now have someone helping them. This is what Mother Teresa intended as she wanted to help fulfill her calling and dedicating herself to God and the service of others. "If an ill person wants medicine, give him medicine, if he wants comfort, then comfort him. We are all God's children so it is important to share His gifts. Do not worry about why problems exist in the world - just respond to people's needs."